After visiting the city of a dozen tombs, I am headed back to the city of the lone fort, Fort Greene, Brooklyn. Some friends (okay, Georgia and Nicholas, that is) think I've become a Delhi "walla" (sp?) aka a Delhi dweller. That is because during the last 12 or so days here I have not left India's capital city though I had every intention to all along. Yep, I passed on the Taj Mahal (just 5 hours away), and Rajasthan's jewel cities of Jaipur and Udaipur. Now it's time to go. (My flight is in just a couple of hours.) 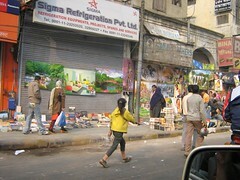 My non-platonic oh-so-tactile exploration of the Delhi markets has come and gone. The Global Voices summit has come and gone. (Check out the Global Voices 2006 Summit Live Blog for all your questions about what happened.) And obviously Delhi and fellow Delhi dwellers (native or not), have rubbed me the right way. I had dinner on the brilliant National Highway, and was graciously and elegantly hosted by the three members of Delhi's Haitian community: the D. family. I'd like to think my presence helped launch a great new blog: Pascale D.'s Natif Natal: L'inde Vue par une Haitienne which I've added to my blogroll under Haitian diaspora. I have tons of pictures. I have even more unformulated thoughts. Most shall be revealed to you soon. Delhi did right by me, and hopefully also by the Francophone online community.